Bihar Vidhan Sabha Recruitment 2018 - Apply Online for 166 Group D Posts (Office Attendant, Driver, Library Attendant, Order Paper Distributor) in Bihar Vidhan Sabha, Patna, Bihar on Direct Recruitment. Online Applications are invited by Bihar Legislative Assembly from 23 Oct 2018 11:00 AM to 22 Nov 2018 05:00 PM for 166 vacancies. 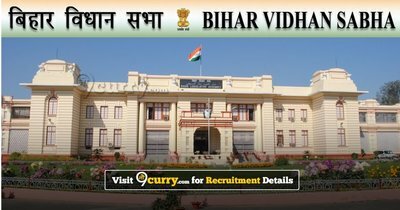 Eligible candidates may apply online at Bihar Vidhan Sabha's website (direct link is given below) from 23 Oct 2018 11:00 AM to 22 Nov 2018 05:00 PM. Candidates log on to http://vidhansabha.bih.nic.in/.